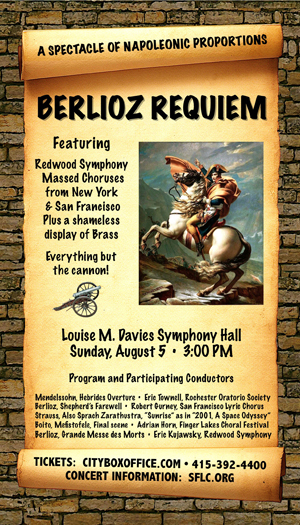 Next Sunday, August 5th at 3pm I will be performing one of the coolest pieces, the Berlioz Requiem, at Davies Symphony Hall with 250 other singers (San Francisco Lyric Chorus), the Redwood Symphony Orchestra and FOUR horn choirs. The horn choirs are going to be placed in various corners of the hall, SURROUND SOUND. I'm so excited about it. It's going to be so kickass. Loud. Dramatic. So rock and roll. Also on the program is that awesome Strauss piece appearing in 2001: A Space Odyssey, you know, the one with the monolith and the monkeys? 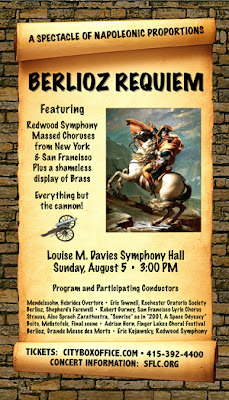 Listen to the "Dies Irae" movement from the Requiem, this is one of the more dramatic movements. The photo above is my choir Conspiracy of Venus (I was not in the group when it was taken) by my friend, photographer Audra Marie Dewitt. 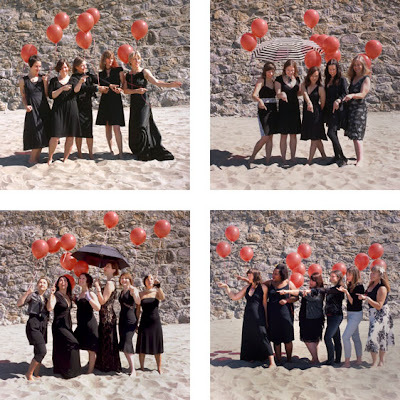 The photographs are part of a book she's self-publishing called All Together Now: Women in Music. Right now there is a kickstarter campaign to get this book printed, and it needs your support! Click here to see the kickstarter campaign. ONLY 7 MORE DAYS! Read this post I wrote on Hear it Local's blog addressing why a book about female musicians is needed. This is a book for anyone who's ever wanted to stay true to themselves and "follow their bliss" (Thank you Miho Hatori)! Audra gave me editor credit in the book, which is really awesome! In the last three years I've helped out and worked on researching and contacting artists as well as copy editing and marketing. I saw the mock up, which is gorgeous, and figured I had a hand in about half of the images. I'm very proud of this project. 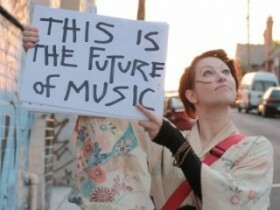 Amanda Palmer, does she really need a byline? Grass Widow, SF postpunk phenoms. First blog post on Hear it Local "Think Like Amanda Palmer"
I'm very excited to announce that writing is finally PART of my job. I started blogging back in 2008 because I needed to tell SOMEONE about what was inspiring me musically. I was out of graduate school and writing about music was no longer something I did on a daily basis, but I still had to do it. I post here, I post on Examiner.com although I barely notice the pennies I get from them... however I do enjoy the free tickets and awesome seats I can sometimes score. But, since Hear it Local is pushing super hard right now to make things happen and we've started publishing original content, I get to post a blog a week. IT'S PART OF MY JOB! Luckily, I had written about Amanda Palmer (thanks to my friend Jessica) three years ago when she had blogged about why artists should demand financial respect from fans. Because of her recent super duper successful kickstarter campaign, it's something that is relevant again. I'm pretty proud of this little piece of writing. READ MY HEAR IT LOCAL POST HERE! 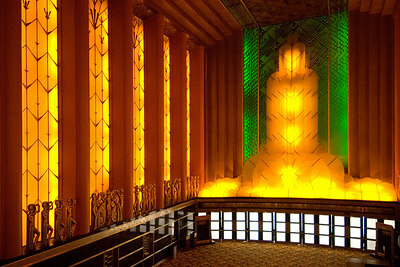 The Paramount Theater in Oakland is one of my favorite places to be. Not only is it incredibly gorgeous, I've seen two of my most favorite movies there this summer: 'Stand by Me' and 'the Blues Brothers' FOR FIVE BUCKS! Both of these movies have two of my most favorite soundtracks of all time. So there has been lots of singing. There has also been boo'ing, cheering and lots giggling. There is something so wonderful about seeing a movie that is near and dear to your heart with a room full of people that love it too. Check it out for yourself! All movies on Friday nights, 8pm, $5. 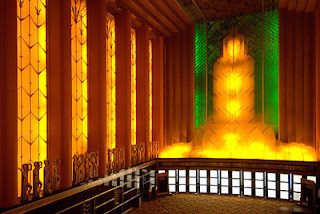 I've blogged about this before, but the Paramount also does tours every first and third Saturdays of the month, also for $5. See my slide show here.